I lived, for a brief period in 1997, near the Boise river and began feeding cracked corn to the ducks that foraged regularly near the house. After moving from that location to the north end, I received a tube feeder and shepherd's hook as a gift and set it up in the back yard. The first bird that I identified was a House Finch (which I later correctly identified as a Pine Siskin). So, I guess Pine Siskin would be my spark bird. There are a couple of people who would be guilty of that. Greg Wardwell and Mike Morrison. Greg is the previous owner of Birdhouse and Habitat and has a contagious enthusiasm when talking about seeing birds and is always up for discussing the details of bird ID and behavior beyond what is found in most field guides. He got the ball rolling. Greg introduced me to Mike before he moved away a few years ago. Since then I have birded with Mike on several occasions and am always and endlessly impressed with his intimate knowledge of bird ID, behavior and where to find them. Mike knows the little details that you won't find in the mainstream literature. Plus he'll take a fair amount of guff before he makes you get out of his jeep and walk. I have always had an interest in wildlife but did not become a birder until 1998. I bird whenever I am outdoors. Walking to the mailbox, biking to work, skiing - they are all opportunities to see birds. My regular haunts are in and near town. The Boise river (from Discovery Park to Eagle), Kathryn Albertson Park, Hyatt wetlands, Boise foothills. In Idaho - Fort Boise Wildlife Management Area. I never get tired of seeing the spring migration of geese and always end the day with a healthy list of sightings. In the U.S. - Prospect Park (Brooklyn NY). I experienced one of the highest concentration and variety of birds of any place I have ever been. I was in the park only 30 seconds when I witnessed a Red-tailed Hawk capture a rat, fly to a perch and consume it. From there I barely put my listing sheet and pencil back in my pocket for the entire 4-5 hours I spent there. It was one bird after another. At the end of the day I had a species total of 47 that included hawks, ducks, woodpeckers, geese, herons, warblers, thrushes, sparrows, finches, and an owl. In the world - I have never had the opportunity to bird outside the US so that one is still open. I could not suggest a specific location but can recommend any area along the river or foothills especially if it is off of the regular path. There are many less explored trails around the ponds bordering the river and in the foothills just above town. Your backyard! Many new birders are unaware of the rotating stream of resident and migratory birds that visit their yard and feeders, and experienced birders can become complacent with the idea that they have a complete list of all the birds that could be seen on their property and allow their yard birding to fall more into routine than adventure. As a new birder I was amazed to see the variety and quantity of birds attracted to my feeders and how that changed over the course of the seasons. As I have gained experience I find excitement in many other aspects of yard birding - seeing great numbers of birds, birds with plumage variation like colour pattern or leucism, species intergrades, courtship and nesting behavior and of course the occasional rarity. A great way to bring new species to the yard is by changing things up. Add a moving water feature, brush pile, flower or vegetable garden or new flora in the form of shrubs and trees. Small changes can bring new birds. More of a watcher and lister than a chaser. My biggest enjoyment from birding is observing behavior. Seeing new species is always good but watching interactions and movement, which reveal the niche of even the most common bird, is time well spent. In the first few years, I was a rabid lister. Lists for the yard. Lists for camping and vacations. Lists for bird walks. Lists of birds I had not seen. Now, I list at new locations I visit and any new birds I see. I also keep track of arrival and departure dates of migratory birds that visit my yard. I use Equinox HP 10x42 binoculars. I also have a Vortex Skyline 20-60x80ED spotting scope. I use Lanius and Thayer (Birds of Idaho) software for PC, Scarlet Owl for Palm Pilot and good ole pencil and paper. I purchased the Lanius early on before researching listing software but found that I really like it. It provides a variety of detailed lists based on the data you collect (life lists, birds not seen, birds seen on any date or range of dates, dates a species was seen, arrival and departure dates, locations a species was seen, etc.). It covers locations worldwide and came with an e-guide to birds of NA and Australia. The Thayer software is good but does not offer as many variations of data manipulation as Lanius. However, there are more photos of better quality, a sound clip of each bird's call or song, video clips of some species, side by side comparisons of similar species, an identification wizard, and multiple quizes to test your birding knowledge. It is very useful for building identification skills at home. The Scarlet Owl software is strictly for listing. It is a neat way to keep multiple lists that you can then hot-sync to your PC. I found it useful for multiple trips to different locations while on vacation. The down side is that you have to make entries using Palm-ese letters which requires about the same effort as using pencil and paper, and if your batteries wear out before you can sync it with your computer, the data is lost. Kaufman's Field Guide to Birds of NA because it contains features I find absent or less user friendly in other guides. It is small, making it easy to carry. On the illustrations in the guide, pointers indicate the key markings so that you can check the book in the field to see what to focus on. In the text, important diagnostic marks are mentioned in italic type. The front of the book contains a pictorial table of contents arranged by groups of birds which also correspond to a colour tab on the side of each page (a feature that makes finding a bird, new to you, quick and simple). If you know the name of the bird, there is also a quick one-page index in the rear of the book. In addition, the copy I own is signed for me by the author which, I believe, brings me wicked-good birding mojo when I am in the field. None. I once wore a tuxedo to a lecture on raptors. Does that count? 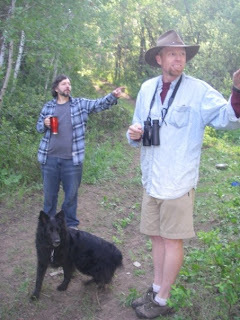 I have studied hummingbirds and raptors the most but would not consider myself proficient. I have more of a broad base of general knowledge of birds. Costa Rica for my fiftieth, and I would like to get back to Central Park for a shot at seeing Pale Male. I get to bird with some great folks at GEAS and SIBA but do not belong to either of the organizations. Pale Male. I have seen numerous Red-tails but would love to this one. After that, Screech owl. I learned to appreciate nature and wildlife from my father. 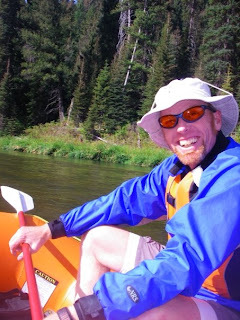 He grew up in Boise and spent much of his time outdoors. He always seemed very comfortable being outdoors and I find the same true for me. Also, I received my first feeder and field guide from my ex-wife Ginny. I am forever grateful to her for sparking and supporting my interests in birds and thankful to her and my step daughter Alice for putting up with my bird-nerdiness. I have always made it a point to rise extra early, when camping, to do a little birding. Early in my birding life, on a camping trip to the area just west of Cougar Mountain Lodge, I arose one summer morning to do just that. I really enjoy hearing and then finding a bird especially if it is a bird I have not had an opportunity to see yet. A few minutes into my walk that morning I heard a high pitched sharp whistle from the understory several yards down the hill. "A new bird!". I pulled my binoculars up quickly and feverishly searched the area for the deliverer of that note. Nothing. I watched for several minutes for any sign of movement. Nothing. Discouraged by the thought of missing a new bird I turned to continue up the path. "Peeeeeeeeeeeep!" There it was again but now 50 feet to the right. "Now how did that bird manage to get over there without me seeing?". No time to ponder, the game was afoot. The terrain extending downhill in front of me was quite steep, thoroughly covered in dense undergrowth, and glistening with the wetness of the rain from the night before. No worries. I have time. I'm relatively young. So off I go. I aim to plant my first step on a downed tree so that I can walk it's length to the area where I heard the bird, thus avoiding the entanglement of vegetation closer to the ground. Bad choice. The barkless trunk covered with a nice layer of moisture made the perfect combination for one of those arm and leg flailing falls that you see on the funny video shows. My field guide, walking stick, and hat all flew in different directions landing several feet away. My fall was broken by a healthy patch of some thorny vine which concealed the large muddy patch just below it. Being assured now that I have scared away any chance of seeing the bird. I begin to recover my guide, stick and hat. "Peeeeeeeeeep" Now it's behind me...100 feet in the other direction. Well. I'm invested now. I may as well go for it. Besides this bird had already cost me a sore shin, numerous thorn scratches, the embarrassment of a wet bottom and a bit of pride. Up the hill I trudge, pausing periodically to listen and look. As I draw near the area, I hear it again. but I am still no closer. The scene repeats itself another 4 or 5 times over the next 2 hours. Stop. Hear it. Move that direction, only to find it has moved an equal distance in some other very-difficult-to-get-to location. I decide on a new strategy. I will stay put and wait for the bird to reveal itself. Twenty more minutes pass before I see movement through the foliage about 20 feet away. I lean carefully to an awkward position to gain a better view through the binoculars. I hold my breath so as not to make noise. With my face firmly pressed against the bark of a tree, I am just able to make out the silhouette of my target. I needed more light. And as if it heard me, it began to bounce with small short hops toward a shaft of light that penetrated the forest and shone brightly on a perch a few feet away. With a clear view in the bright light of the morning, my binoculars focused with surgical precision on my prize and its diagnostic markings easily visible, I was able to definitively identify my bird as a Spermophilis lateralis (Golden-mantled Ground Squirrel). My first thought is to say hummingbird because Fred Bassett says that "if hummingbirds weighed even a few pounds, they'd rule the world" (referring to their tenacity) and I weigh 205. But ever since I was a kid I thought it would be cool to be a duck. They can fly. They can walk They can swim on and under the water. They can go practically anywhere and that is appealing to me. I got a perfect attendance certificate in sixth grade. I don't have an exact number (as there are some birds I saw, as a kid, before becoming an "official" birder) but it is somewhere between 200 and 250. Don't have one yet but hope to make it the Amazon rain forest. To always bird wherever I am, to find the singing bird and match the voice to the singer, to watch as long as the opportunity allows, to see more species, and to understand better the behavior of birds.